The funding period for Gun Rocks is now over. The funds received from the Heritage Lottery Fund and the Jubilee Trust had to be spent within the 12 month funding period. This was a challenge, what with the trail not being installed until May 2018, be we did succeed. In fact, over the last 12 months, this project has achieved almost everything it set out to do; though the origin of the wreck still remains a mystery! The CrowdFunding money was not time linked, so this money will be used for ongoing trail maintenance and website hosting costs. The Summary Report was written so that it could be amended accordingly then submitted to each of the funding sources to provide them with information on how their funding was spent and what the tangible outcomes of the project have been. It was also intended as a stand-along report, so that interested parties can find out what we have done during the funding period. The report has also been submitted for the 2018 Duke of Cambridge scuba prize…. (fingers crossed!). If you would like to read the summary report please click HERE! and it should download in PDF. Or visit the Reports Page, you can download it from there too. All it remains to do is say a huge thank you to everyone who donated. The project does have a legacy and will continue. Tyneside 114 BSAC, will continue to maintain the trail and the website for the foreseeable future. 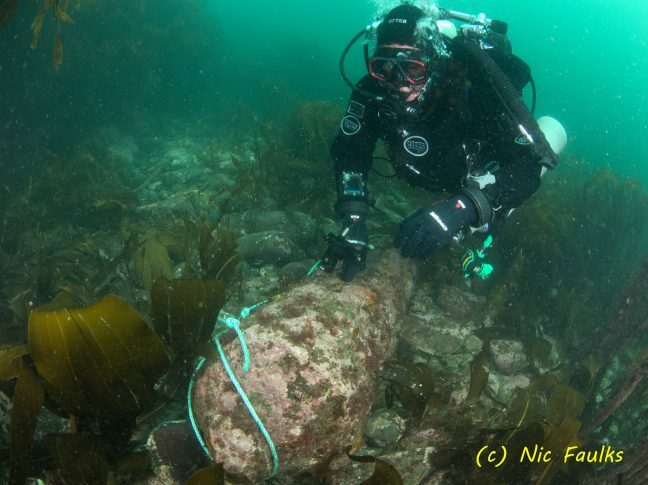 We also hope that many many divers continue to use the dive trail, and that divers and non-divers alike enjoy learning about the cannon and the marine life of Gun Rocks. ← The dive trail is open!